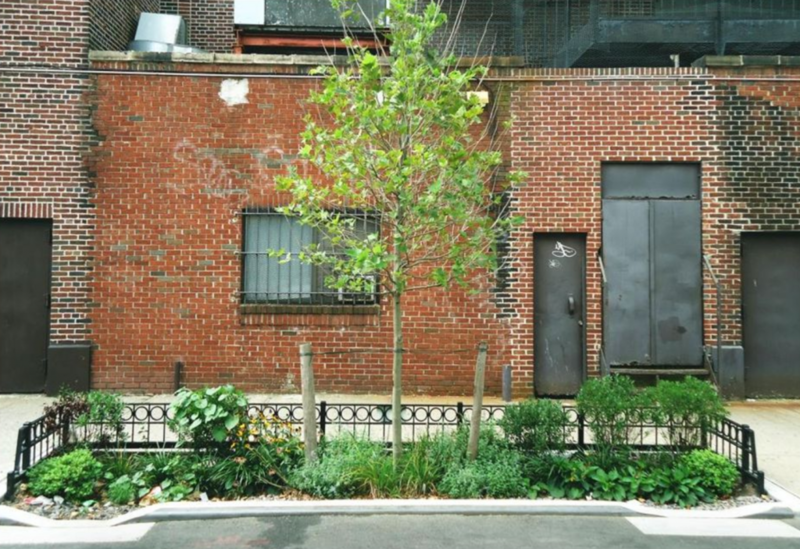 Gray vs green infrastructure: What is it? A lot of things about cities are great for the environment. By design, cities encourage small living spaces, allow for short commute times, and incentivize the use of public transit over private cars—all of which help to curb carbon emissions. Concentrating people in cities also helps decrease environmental erosion and human encroachment on wildlife habitats. The list goes on. But nothing is perfect. One major environmental liability of cities lies in the overabundance of stormwater runoff they produce. Stormwater runoff is what heavy rain becomes when it falls on the urban landscape and slides off all its paved surfaces (think roads, sidewalks, roofs) into storm drains. From there, it flows into nearby bodies of water, taking trash, animal waste, oil and gas, and other urban pollutants with it. Yuck! But wait—it can get even grosser. In hundreds of cities across the U.S., “combined sewer” systems can be overwhelmed during big storms and flood rivers and lakes with raw sewage. Ugh. Read more about the “poonami” phenomenon here. In addition to contaminating waterways, excess stormwater runoff can also cause flooding and erosion in urban rivers and streams, which in turn can damage habitats, buildings, and property. This runaway water can even wreak havoc on the very infrastructure that was built to manage it! Until recently, urban stormwater runoff has been dealt with mostly by what we call gray infrastructure, the term for traditional human-constructed management systems like drains, pipes, dams, reservoirs, and treatment plants. Gray infrastructure helps to make urban life as we know it possible—and for that, we are grateful! But it’s expensive, it’s usually not attractive, and, as you just read, it isn’t always adequate. Enter green infrastructure: the term for stormwater management systems that either mimic the way nature deals with a sudden influx of water, or otherwise harness it for environmental (and human, and animal) benefit. Green infrastructure employs permeable surfaces (like dirt) and natural water suckers (like plants) that encourage rain to sink slowly down into the earth, where it can recharge groundwater sources and feed plants’ roots. This slow-drip effect works to prevent flooding, filter pollutants out of stormwater before it reaches open water bodies, and populate urban areas with greenery. What’s not to like? Every community—in fact, every resident—can initiate some kind of green infrastructure project to help reduce the amount of pollution and destruction that result from excess stormwater runoff, as well as the amount of taxpayer money that goes toward managing it. As you can imagine, the more green infrastructure there is in a city, the more effective (and beautiful) it is. That’s one reason it’s so exciting to see local governments investing in it like never before. That said, every little bit does help: even a handful of citizen-led green infrastructure projects can start to make a dent in a city’s stormwater runoff problem. And even more than that, they can signal to other residents—as well as to area politicians and officials—that such projects are possible and popular. Another fantastic benefit of green infrastructure is that, unlike most any human-made system, it works better the longer it’s around, instead of wearing out and needing repair or replacement. As trees’ and other plants’ root systems grow bigger, they can absorb more and more stormwater. Talk about an appreciating asset. Neighbor-led green infrastructure projects are also fantastic opportunities to meet, work alongside, and bond with your neighbors. Really, any group can get in on the fun and benefits! Nonprofit organizations, schools, chambers of commerce, faith groups, or just a few motivated friends—you name it. 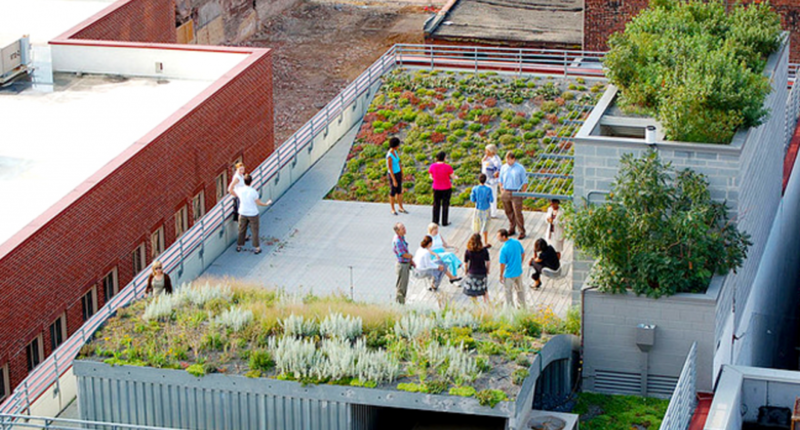 Ready to see more green infrastructure take root (literally) where you are? 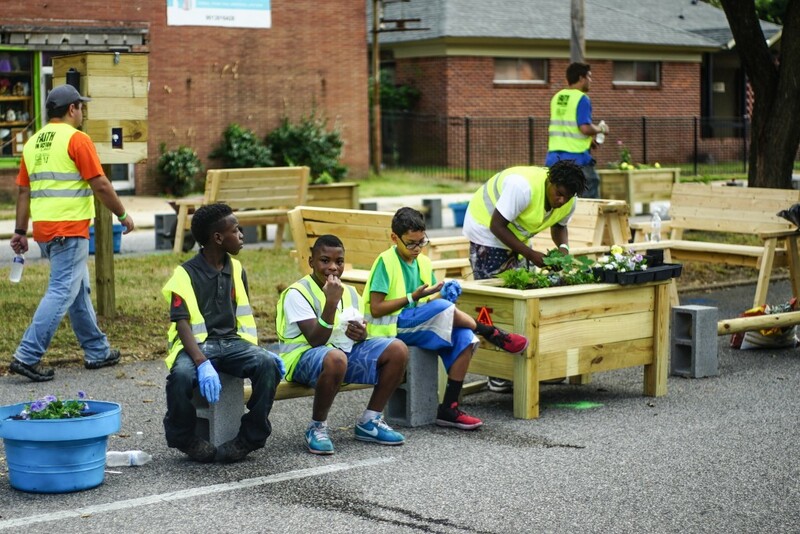 “I’d seen flooding at the site and knew it was a problem,” says three-time ioby Leader Robyn Mace of the neglected lot in her native Memphis where she led a successful campaign to build a rain garden. While green infrastructure projects can help manage stormwater runoff wherever they’re installed, they do the most good when they’re sited in areas that have a hard time keeping up with rain on the regular. If you spy a low-lying area that turns into a massive puddle after every thunderstorm, you’ve got yourself a candidate for a bioswale, vegetated filter strip, rain garden, or similar amenity. Of course, projects like green roofs and planter boxes can also be added to buildings that don’t show any signs of rain-strain. If you can offer up your house, school, or church for this purpose, so much the better! To help determine the best site for your project, as well as the best type of project to build there, think about what you want to accomplish. Stemming flooding is one great reason, but maybe you’re a paddling or fishing enthusiast and have heard about polluted waterways in your area. Leveraging the water-filtering power of a green infrastructure project like permeable pavement on a patio, driveway, or parking lot is a great way to promote higher water quality. Perhaps you just want to see more trees, grass, or flowers were you live—and you know that turning a regular greening project into green infrastructure project is often possible without too much more ado. For instance, if you were thinking of turning that vacant lot into a green space anyway, why not consider making it a regular rain garden? Whatever your goals, keep them top of mind as you plan. They’ll be your best guides to a successful and satisfying project. ioby is all about crowd-resourcing. This combines two types of assets—monetary donations from crowdfunding with the will and skill of resident communities—to make positive change happen in neighborhoods. This approach is so successful because it makes use of every resource a community has, in whatever amounts and forms it has them. Is there a green thumb in your group who could help pick native plants for a vegetated filter strip? Would any teachers you know love to do a green infrastructure project with their class? Is a member of your city council particularly interested in water management issues? Inspiration, and help, could be anywhere. Think big, think small, try to think about it all! Especially in the early stages of their work, local leaders often find that quick wins are a key to lasting success. If you and your neighbors can get a small project with a short fundraising timeline and a rapid implementation schedule off the ground, it will help everyone who participated to see themselves not as passive observers in their neighborhood’s development, but as active stakeholders in the future of their community. When people invest and see quick returns, they’re more likely to invest again and again, which is what keeps successful neighborhood projects going year after year. Focusing on early quick wins also proves to local officials and organizations that you have what it takes to go bigger, which means they’re more likely to invest in your work, too. After you’ve got a nice quick win or two under your belt, you might consider reaching out for broader support of your efforts. In addition to your network of neighbors, consider who else might make a good partner. Think about other people and groups who have a vested interest in stormwater runoff issues, and/or who are in a position to help do something about them. Maybe your neighborhood’s business improvement district? Your city’s department of transportation? Your local water services company? Depending on whether you might want to seek broader permissions, a funding match, or more publicity, there are many possibilities to strengthen your project with partnerships. The Guide to Green Infrastructure projects outlines everything you need to know when building a Green Infrastructure project– including bioswales, rain barrel catchment systems, depaving and more! More green infrastructure info from ioby: This page outlines several types of green infrastructure projects communities can take on themselves, and offers links to further reading on specific related topics. The Green Infrastructure Center: The GIC helps local governments, neighborhoods, regional planning organizations, developers, land trusts, and others evaluate and maintain their green infrastructure assets. Methods and Strategies for Financing Green Infrastructure: While this report was written in and for Durham, North Carolina, it offers lots of great ideas about how to forge partnerships and find funding for green infrastructure projects nationwide.